A pair of strange new worlds that blur the boundaries between planets and stars have been discovered beyond our Solar System. 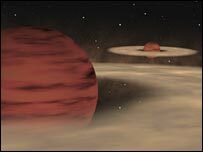 The pair belongs to what some astronomers believe is a new class of planet-like objects floating through space; so-called planetary mass objects, or “planemos”, which are not bound to stars. Free U2 Concert in Melbourne Australia 17 November Maybe?